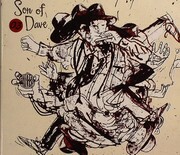 Critically acclaimed festival favourite, Son of Dave, returns with a second album of inspired 21st Century blues. The Son Of Dave sound has expanded adding guitar, piano, organ, a plucked cello and even backing vocals to the staple looping harmonica, beat-box and foot stomp. Animated music video by acclaimed video director Scott Juno (The Pipettes, The Dead 60s, The Zutons). 02. "Old times were good times"
04. "Lover not a fighter"
07. "I'm not your friend anymore"
09. "I just wanna get high with you"